Greece is an incredible nation and a favorite travel spot for many. Greece is a country comprised of thousands of islands. Being saturated in history and abundant in natural beauty from beaches to cliffs, Greece is the cradle of Western Civilization. Venture here to explore ancient landmarks from centuries ago. Greece also boasts 5th-century ruins like the Parthenon and Acropolis of Athens. Another historical travel destination to add to your list is the town of Meteora. Travel to Meteora if you want to experience authentic Grecian history and incredible scenery. Meteora is a series of enormous rock formations in central Greece and a World Heritage site. Here you can explore six Eastern Orthodox monasteries, with the history preserved within Meteora dating back to the ancient Grecian times. The vast plains are dotted with massive rock formations. This place will make you feel as though you are in another world as you look out on the horizon at the rolling hills that stretch as far as the eye can see. With such natural beauty, it is not surprising that Meteora offers exceptional scenery for cinema productions. You can even find the Eyrie Kingdom from the popular HBO series Game of Thrones. Meteora offers many recreational activities for its guests. You can take a hiking tour across this Grecian landscape for some incredible views. Opt for the sunset tour and experience the romantic ambiance of these rocks at twilight. As evening falls you can enjoy the magical nighttime skyline of the town of Kalambaka, nestled within Meteora. If you prefer an aerial view of your surroundings, try a rock-climbing excursion. Take a chance and scale Meteora’s massive rock formations. You will reach greater heights and gain a new perspective. Athens is the capital of Greece and offers convenient train routes to reach Meteora. Travelers can fly into the airport here and then ride the rails all the way to their beautiful destination. 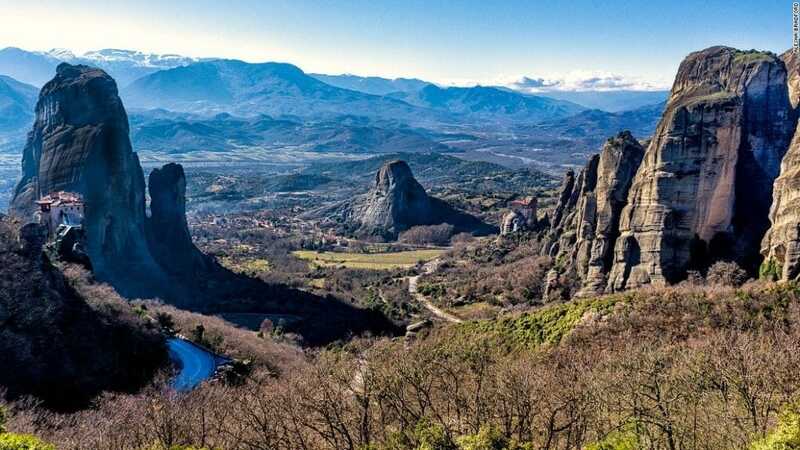 Make the trek to Meteora soon and marvel at the beauty of this Grecian historical hotspot.